Article by Doug Chaltry; last updated 26 May 2008. The second Sherman release from UM, this kit is basically the same as their earlier M4(105) release, but with a new turret and decals appropriate for the 76mm version. Since the kit is mostly the same as the previous kit, so too is this review. 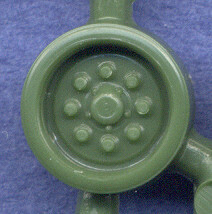 Scroll down to the turret sprue to get to the new stuff. 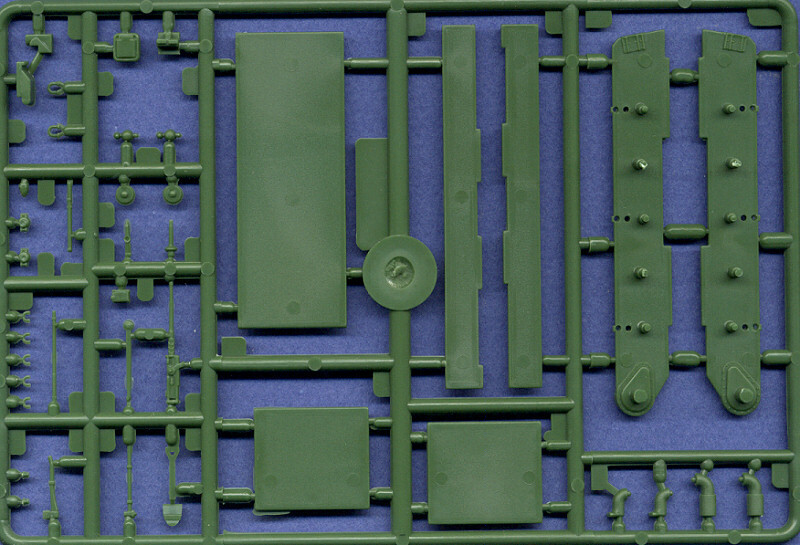 Beginning with this first sprue pictured above, you can see the main strength of this kit in its wide array of optional parts and its modular design. The hull is bare bones, which is both good and bad. There aren't any pioneer tools molded onto the hull, the hatches are open, and even the fuel filler caps and ventilator cover need to be attached. However, it is also lacking any sort of surface detail, such as a texture to the hull armor, or even weld lines between the armored plates. Thankfully, these are things that can be added quite easily by the modeler. It's difficult to measure the hull length without first assembling all the hull parts, but the hull width is spot on for this scale. Look at the options: there are three different fenders included (M4/M4A1, M4A2 and M4A3), four different rear hull plates where the exhaust parts are located (M4, M4A1, M4A2 and M4A3), and three different rear armor plates for the upper hull (M4, M4A2 and M4A3). The engine deck on the hull top is open, which allows for inserting the engine deck of your choice, and it also makes it easier for the modeler to install an engine compartment if they feel like scratch building one, or if some industrious aftermarket company were to make some (are you listening Goffy?). The crew hatches, though molded open, are detailed only on their outer surface. The above sprue is shown front and back. Only one copy of this sprue is included in the kit. This sprue provides the lower hull parts, a pair of engine deck inserts, and many of the kit's smaller details. 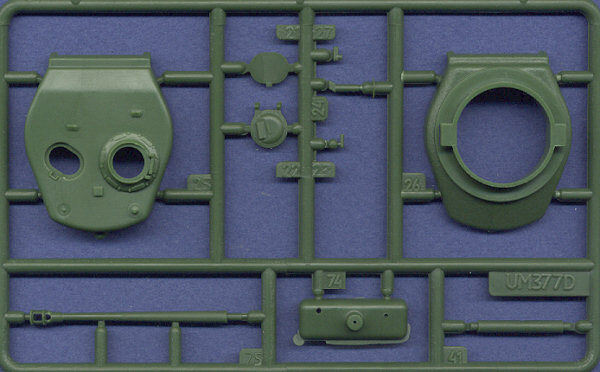 The engine deck for this particular kit, the M4A3, is included on this sprue. In my previous review I commented that this part was mis-shaped for the M4A3, but I was mistaken. 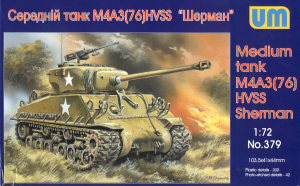 This engine deck in fact represents a very early version deck of the M4A3, but one that was rarely seen. So although the deck is accurate, I wish that UM would have used the more common type of engine deck seen on almost all M4A3s. 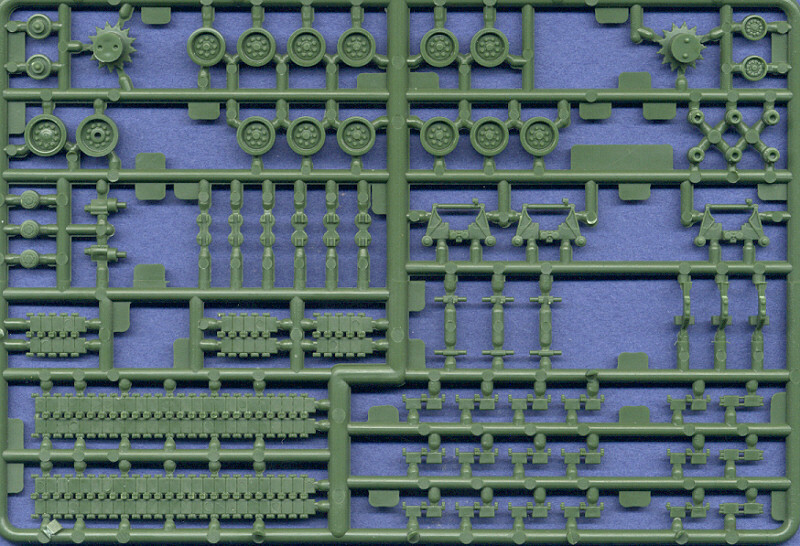 Other details on this sprue include a fine selection of pioneer tools, fluid filler caps, lift rings, machineguns, and exhaust parts. Those funky looking parts in the upper right corner of the scan (#46 and 69) are actually forms to be used to press the brass parts into them and bend them into their proper shapes. This is really cool, and I wish all companies that include brass parts in their kits would follow UM's lead on this innovation. 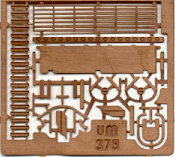 The wheel and track sprues are shown above, front and back. Two copies of this sprue are included in the kit. If you refer to my article comparing the HVSS suspensions of this and three other kits, you will read that overall the suspension in this kit is pretty good. The scale accuracy of the parts is very good, though not perfect; the level of detail on the bogies is very good, though not perfect; and the bogies are very complicated and take a fair amount of time to assemble. But the result is light years better than the old Hasegawa HVSS parts, and I really like this suspension a lot. The tracks are my favorite HVSS tracks currently available simply because they are molded in link-and-length, hard plastic. The raised chevron detail isn't as fine as other kits, but once painted and weathered, I think they will look great. The sprocket wheels are the late version with the solid metal sprocket ring (no cutouts behind the teeth), but they could be a little more detailed. 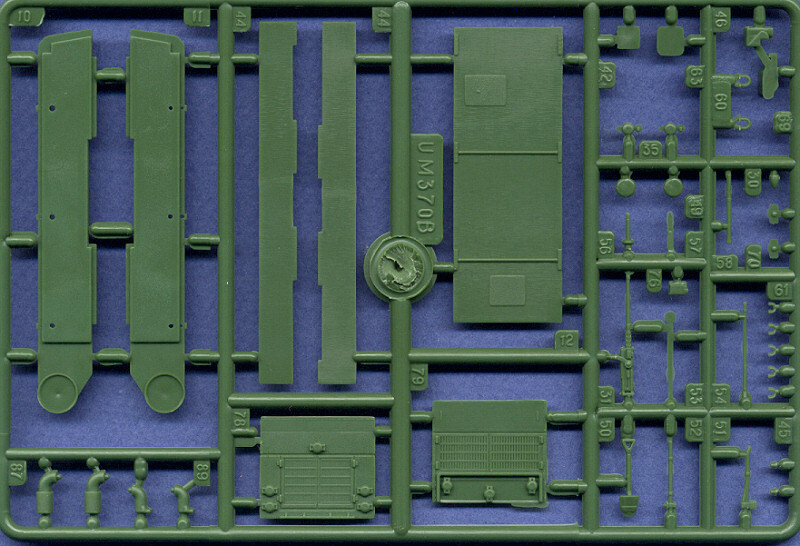 And here we have the new sprue for this kit with parts for the 76mm T-23 turret. Basically, it's horrible. What did UM use for reference? The Hasegawa kit? It's too wide and very flat. Perfectly vertical side armor and very simplified and flat surface details. Although the gun barrel may be almost perfect in length (depending on which drawings I consult), the gun's rotor shield is so wide it measures to about 1/58th scale. Well, if I ever need an all-around vision cupola for another kit, I can always carve this one off the turret, as the cupola at least has acceptable detail, though it's not great. Got a spare gun barrel too, so I guess it's not a complete loss. While a turret such as this could be expected in a 1970s-era model, it is incredibly disappointing for a kit released in 2008. Etched metal parts (which I think are copper, not brass) are etched in two passes, and are fairly thick, which is pretty great. The typical headlight guards are provided (though not periscope guards), as are parts of the rear hull storage rack, engine exhaust grate, and the brackets for the extended side fenders. So. If you are looking for a good donor kit of an HVSS suspension and tracks, this is the kit for you, as you won't have to wonder what to do with the left-over turret. 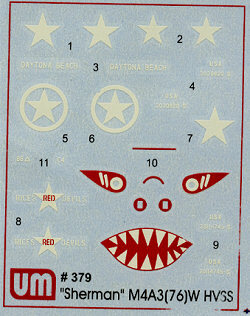 But if you're really interested in building an Easy Eight, look elsewhere (like Dragon or Trumpeter).